Toshiba has left it pretty late to enter the already burgeoning netbook market, but the company has certainly come up with a stylish addition. The NB100 houses a 8.9-inch widescreen TruBrite display (1024 x 600), up to 1GB RAM and up to 120GB hard drive storage. 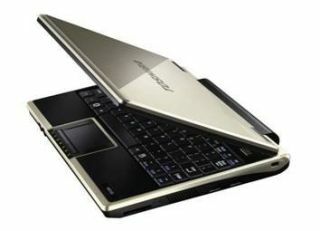 There's also Wi-Fi connectivity – obviously as it is a netbook – three USB ports and it even acts as a charger for your MP3 player and the like, thanks to the Sleep-and-Charge technology. The netbook is available in three colours: Cosmic Black, Champagne Gold and Bright Silver, and the whole thing weighs in at just under a kilo. The computer ships with either Ubuntu 8.04 or Windows XP Home Edition. No prices yet, but the NB100 will be in shops this October.